I had the great privilege of meeting another Airgunner and getting out to do some Ground Squirrel hunting. Napoleon and I met up early Friday morning at around 6:45 am and proceeded to the hunting area around 7:00. This was my first time getting to shoot with someone who had nicer stuff than I, so I was to say the least a little intimidated by a FX .30 Bobcat with a 6-24 Sidewinder on it. I have to say right off the bat Napoleon was humble and as a true passionate Airgunner as I. We both walked a short ways from our vehicles towards a large rock that overlooks a canyon with Ground Squirrel holes anywhere from 60 yards out to 144 yards. I have frequented this area for over 30 years and know the area better than most. Years ago the area had been hunted quite heavily and has in the past been visited by well known hunters such as Jim Chapman and Tofazfou. Over the years I have taken a good share of kills on this mountain and find it to be one of my favorite Ground Squirrel areas. The day was quite windy with gust up to 30 mph, which is quite normal for this area this time of year. 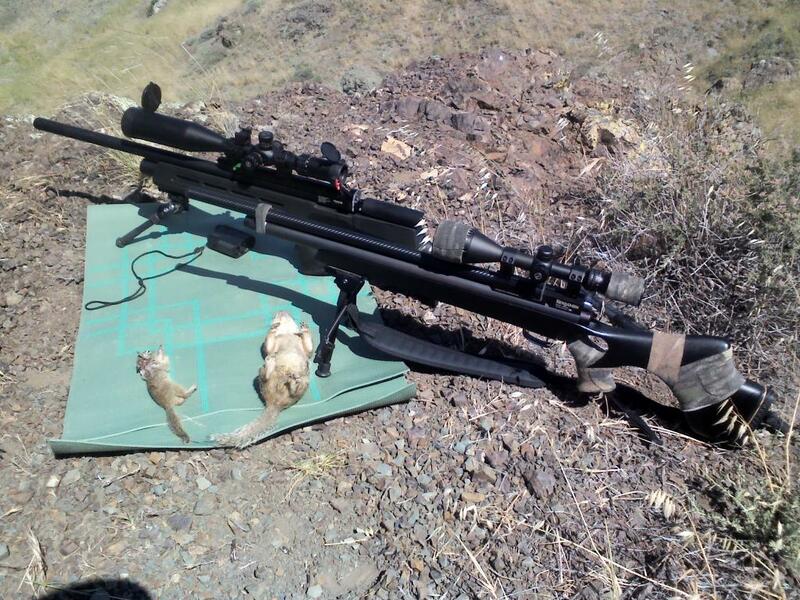 We set up on the rock and proceeded to locate the best targets that all seemed to be around 95 to 124 yards away. Napoleon used his binoculars and rangefinder to make the appropriate mill-dot adjustments with the help of Chairgun. I ended up getting one as he poked his head out of a hole next to a rock outcropping and then Napoleon quickly WALLOPED one soon after. The .30 pellet really is a great choice when it comes to this type of hunting where you have wind and ranges that even a .25 may find difficult. You definitely know when you hit something with a .30 as it holds its energy even at long range. We decided to take a break for about 20 minutes to let the Ground Squirrels settle down and forget about us, as we walked back up the hill I took one at around 70 yards. After our 20 minute break we sat on the rock and spotted a few at 124 yards, I got another one there and then Napoleon made and amazing head-shot on a juvenile in 30 mph wind at 124 yards. Napoleon is a great marksman and uses that gun for exactly what its made for. I ended up leaving around 2:00 feeling great, didn’t pump once the whole day either because he was kind enough to let me top off with his tank. I encourage you guys to seek out members near you to hunt or shoot with,great way to learn and make new friends that share your interest. Thank you Gateway to Airguns for starting the members map. another great write-up and hunt Dana. As you welI know, I’ve done quite a bit of pesting with Napoleon, and I can say that it is not only a pleasure,… but it is always a fun learning experience for me. He is a GREAT shot, and I have watched him make Many shots, that are well beyond my capabilities. Always a great time, and many many more ahead.